Today is kind of a sad day. One of my best friends lost their mom, unexpectedly. Two weeks ago she was giving me the greatest figs from their backyard and we were chatting about medical insurance of all things. I will miss her. But what is really hard, is to know that my friend is in so much pain…and that I can’t really do anything about it. Sure, I’ll go on being a friend, but ultimately I am powerless over his grief. Sorry to be such a bummer. 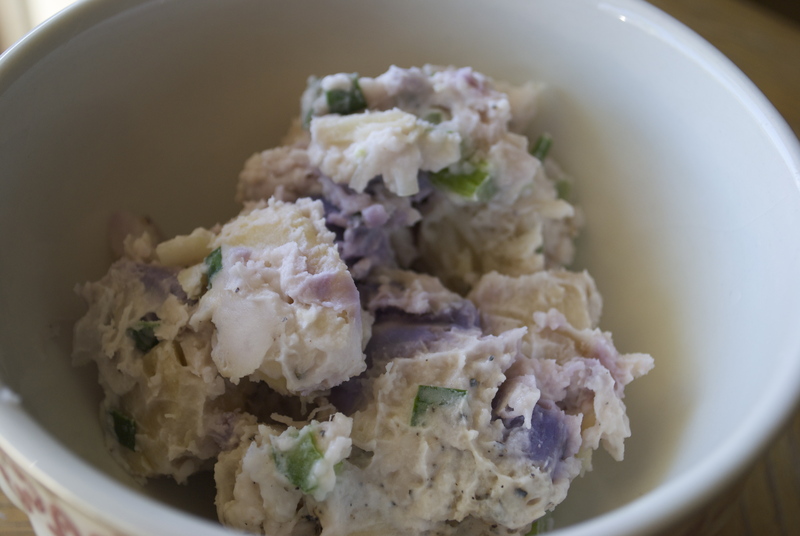 Use 2 to 2.5 lbs of: Molokai sweet potato, firm ulu/breadfruit, and taro. Remove the ulu from its outer skin. Likewise, peel your taro too. Make sure to wear gloves or cover your hands with a plastic bag while working with taro. It has a tendency to irritate bare hands, mine included. It’s fine once cooked. Depending on your taste, peel or don’t peel your sweet potato. Cube root veggies/ulu into small pieces. Bring a pot of lightly salted water to a boil. Boil veggies until fork tender, about 15-20 minutes and drain them. Wait for the veg to cool and whisk together the dressing. Once the root veggies & ulu are cool, toss with the dressing. Refrigerate for a few hours before serving. ← Tropical Cornmeal Shortcakes w/ Kiwi, Pineapple, Lilikoi & Coconut Cream. Thank you; you are so right about the food. I’m really sorry to hear about your friend’s mom. Life is so fragile. thanks for sharing all these amazing recipe. I don’t think I can find taro or ulu or Maui Mustard around here, but I really enjoy reading about all your special ingredients and special recipes.